Create your own backyard oasis with our beautiful Amish hand-crafted garden classics collection. 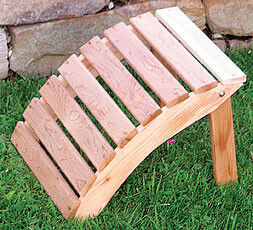 This furniture line is built from the finest quality untreated, all natural, western red cedar. Available unfinished or stained. All stained and painted pieces are hand-dipped for a complete coating. On each piece we use Storm Plate 30, a 100% acrylic exterior paint that resists peeling and flaking by "breathing" to let damaging moisture escape. Take a break, sit down, and relax, it's that easy to choose your style, your size, your color and enjoy many long afternoons escaping from reality.